Broccoli, which is also known as brittle, asparagus or sprout cabbage, belongs to the genus of cruciferous plants. Broccoli and its cousin cauliflower occupy a special position here: Unlike other cabbage, its inflorescences are consumed rather than its leaves. Originally, broccoli originates from Asia Minor and was known in Europe for a long time exclusively in Italy. It was not until the 16th century that the plant arrived in England and in the 18th century it was introduced to the United States. In German kitchens broccoli did not gain great popularity until the 1970s. The vegetables are not only rich in minerals such as potassium, calcium, iron and zinc, but also in vitamin C and provitamin A. 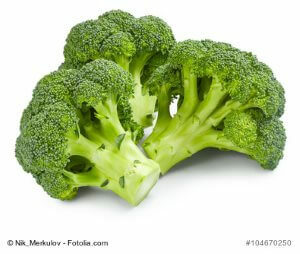 In addition, broccoli contains health-promoting mustard oil glycosides and the secondary plant substance sulphoraphane. This substance has already been proven in scientific studies to effectively stop tumor growth and kill cancer cells. Buy fresh broccoli – what to watch out for? Open-air goods from Germany are available from the end of July to October; otherwise broccoli is imported almost all year round. The cabbage is also available all year round as frozen food. Strongly green and crisp: When buying fresh broccoli, make sure that the buds of the florets are tightly closed and the head feels compact. Open buds and a yellowish shimmer indicate that the cabbage was harvested too late. Storage: Fresh broccoli can be stored for 1 to 2 days in the vegetable compartment of the refrigerator. During prolonged storage, the vitamins and taste are quickly lost, the cabbage becomes yellow and unsightly. If you want to buy broccoli in stock, it is best to freeze the individual florets in order to store them without vitamin loss. Flavour: Broccoli tastes only slightly like cabbage and is reminiscent of green asparagus. Be careful, if the vegetables smell like cabbage already in their raw state – then it is already withered and should be disposed of. The tender cabbage does not require long cooking times and can be prepared in many variations. Wash the fresh cabbage whole under cold water and shake it dry. How you divide the florets depends on the desired method of preparation. Just like cauliflower, broccoli can be boiled as a whole head – all you have to do is cut off the stalk. To prepare the florets, separate them individually and peel their stalks if necessary. For a soup, you can even peel the main stalk and dice the inside. Step: Put salt in a pot of water and bring it to the boil. Step: Add the fresh broccoli florets and cook for 6 to 10 minutes. If you choose a shorter cooking time, the cabbage remains very crisp; if it cooks for more than 10 minutes, it can become muddy. If you want to boil the whole head, you have to plan 12 to 15 minutes in the water, and if you use a lot of boiling water, some of the broccoli’s valuable ingredients will go into the liquid. This cooking method is therefore ideal for soups in which the cooking liquid is also used. If you only need the vegetables for your dish, steam them in a little water without losing any vitamins. Step: Fill a pot about 2.5 cm high with water. Step: Insert a steaming insert or a suitable cooking sieve into the pot and make sure that it does not touch the water. Bring the liquid to boil on medium heat. Step: Place the fresh broccoli pieces in the tray, put a lid on top and let the vegetables steam for 5 to 7 minutes. Tip: This cooking method preserves all important ingredients in vegetables. If you want to flavour the cabbage while steaming, add a dash of soy sauce, lemon juice or garlic to the cooking water. Step: Place the cleaned fresh broccoli in a microwaveable bowl. Step: Add about 2 to 3 teaspoons of water per 500 g of broccoli and cover the vegetables with a microwaveable lid. Step: Cook the cabbage at the highest level for about three to four minutes. After about two and a half minutes, you can check the consistency of the vegetables and, if necessary, re-cook them without losing any vitamins. 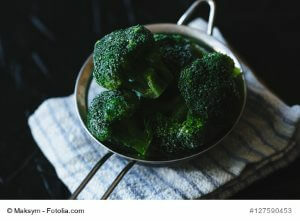 Tip: It is often recommended to quench the broccoli after cooking so that it retains its fresh green colour. Unfortunately, the tender vegetables quickly lose their temperature and then get cold on the plate. If you serve broccoli immediately after cooking, its colour does not fade and its temperature is pleasant. Asia broccoli: This popular vegetable gets an Asian touch if you fry it in 2 to 3 tablespoons of coconut or peanut oil in a pan for one to two minutes. Add 2 cloves of fresh garlic, a chopped chilli pepper and a little bit of freshly grated ginger to 500 grams of fresh broccoli. Remove the browned florets with a little water and let them stew until they have the desired consistency. Season the cabbage with a little soy sauce and toasted sesame oil and garnish it with sesame seeds or 2 to 3 tablespoons of chopped peanuts. Broccoli cream soup: Fry a chopped onion in a little butter until translucent and add the cleaned broccoli and two diced potatoes. Add vegetable stock and let the vegetables simmer gently. Then puree the soup and refine it with milk or cream. Taste the dish with salt, pepper, nutmeg and some lemon juice. Broccoli casserole: This is how you make the green vegetables tasty for children too: Put 400 g of fresh broccoli and 400 g of cooked pasta (e. g. Farfalle or Penne) into a casserole dish. Mix a cup of sour cream, 2 eggs and 100 grams of grated cheese and season it well with pepper, salt and nutmeg. Pour the cheese mixture over the casserole, sprinkle with parmesan or grated mozzarella if necessary and bake for about 35 minutes at 200 degrees. Suitable spices: If you serve the broccoli as a side dish, you can season it in many different ways. A few teaspoons of butter or a dash of olive oil enhance the delicate taste of the vegetables. Nutmeg goes well with traditional dishes; broccoli gets a savoury taste with garlic. Almond flakes also go well with broccoli as a fine side dish. The fresh broccoli can be prepared as a side dish in many different ways. Crisply cooked and delicately refined with Asian spices, almond flakes or a fine béchamel sauce – this is how almost every critical eater can be convinced of fresh broccoli. The better the green cabbage tastes, the easier it is to benefit from its health-promoting properties.